Anderlecht is an urbanized municipality, with industrial and commercial zones (shopping centres and several vocational schools—catering, hotel management, horticulture) alongside its residential areas. But each neighbourhood has gardens and parks, preserving the balance between nature and the man-made. Anderlecht’s most famous resident was the 16th century theologian and humanist Erasmus. His home, with its medicine garden and its museum housing his writings, is a well-visited attraction. But Anderlecht is more known these days for its very successful football club, the most popular one in Belgium. 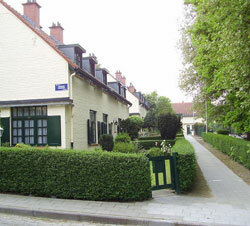 Some of the neighbourhoods in Anderlecht are the green Het Rad district and the formerly industrial area of Anderlecht Cureghem, a residential and commercial district with large mansions, several fine shopping streets, restaurants featuring the cuisines of several countries, and an interesting, multicultural atmosphere. And every year, a “carpet of tulips” grows in its town square—thousands of flowers of every colour for visitors to walk through and admire.